A focused Site Investigation was completed for a dry cleaner site in Portland, OR. Results showed contamination levels of PCE as high as 120,000 ug/L in groundwater and 320,000 ug/L in soil. It is believed that the source of the contamination was a leaking sewer line beneath the facility. The high concentrations suggested the presence of Dense Non-Aqueous Phase Liquid (DNAPL) and a remedial technology was needed to address the distinctive contaminant concentrations. The HRC® application at this site is significant since it was the first time HRC-X® was injected, along with HRC, to treat VOCs. The extended life expectancy of HRC-X, 2 times-3 times that of HRC, made for a feasible option to reduce the high concentration of PCE. 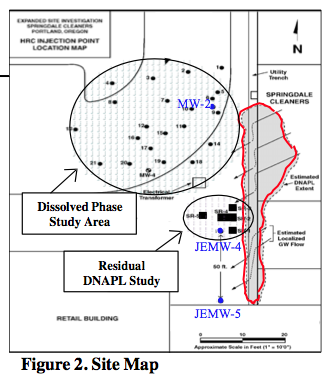 A pilot study was implemented using HRC to target the area near wells MW-1, MW-2, and MW-4 while HRC-X was injected near JEMW-4, the projected area of DNAPL. 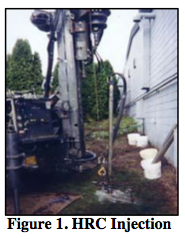 Remediation Objective: Pilot Study to prove HRC applicability at the site. 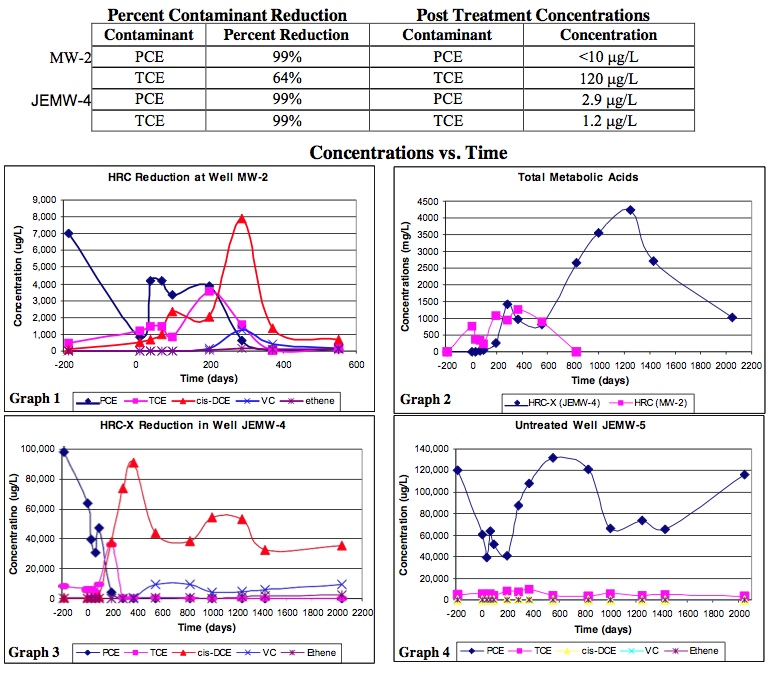 HRC performance in MW-2 produced sustained degradation of PCE and TCE as well as their breakdown products over roughly a two year period (Graph 1). HRC metabolic acids peaked around 1300 mg/L after a year then tapered off over time (Graph 2). HRC-X performance in JEMW-4 and JEMW-5 indicates unprecedented performance in terms of contaminant reduction and total metabolic acid production and longevity. JEMW-4 shows significant reductions in high concentrations of 100,000 ug/L PCE to near non-detect (ND) levels in approximately 300 days (Graph 3). PCE levels continue to remain at very low levels for greater than 5 years after HRC-X application. TCE was also reduced significantly from 90,000 ug/L to approximately 35,000 ug/L in close to 4 years. Daughter products such as cis-DCE and VC have been produced as a result of the parent product breakdown and are eventually expected to dissipate. Metabolic acids remain high (1000 mg/L) as a result of the HRC-X application. HRC-X continues to reduce high concentration PCE and daughter products TCE, cis-DCE, and VC more than 5 years after injection.